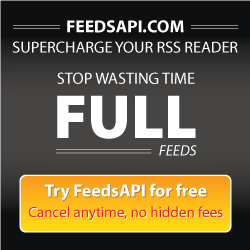 There has been a lot contradiction among the site owners about the length of RSS feeds. From some point of view, partial feeds are better than using full article where others think sending full story as RSS is more beneficial than using just the excerpt in current days. The question is yet unsolved and the site owners follow their personal preference on this matter. However, the service providers and applications of RSS feed offer both full and partial part of an article as RSS feeds. The partial RSS feed allows the readers to read only the starting or a summarized version of the full story. For reading the whole article, he has to click the “Read More” button that comes at the end of the summery. By clicking the button, he is redirected to the page of the website where the original article is published. He can read the full story there. On the other hand, in full article feed, the readers get the full story right inside the feed and they do not have to visit the website to read the full article. The benefit of using excerpt of an article as RSS feed is the site owner will get a good traffic in his site which will increase his page rand in search engines. Getting more people in a website is the main idea and target for any site. In case of partial feeds, if the reader finds the topic interesting, he may click the “Rea More” button to visit the website. And that serves the purpose of the site owners; but if reader gets the full story right in his feed, he will not be interested in visiting the actual website. On the other hand, serving full article as RSS can save a lot of time of the reader. If a partial feed is send to the subscriber and he visits the main website to read the full article after finding the summery interesting and later finds out that the full story is not as charming as the summery, it surely creates a negative impression. In this case, there is a good chance that he may feel cheated and unsubscribe his subscription from that site. So sending full article is much safer from this perspective. And if the quality of the article is really high and if it contains valuable information, the reader will be inspired to visit the site to see if there is something else for him there.